Hey, Jewels! I have been increasingly experimental with cooking food over the last year as I understand that healthy, reasonable food does not have to be boring. Devin (husband) and Ayden (13-month-old) have been on board thus far, so that’s a definite plus! In an effort to help you on your journey to wellness or to just sweeten up your day, here is a recipe I absolutely love to make. 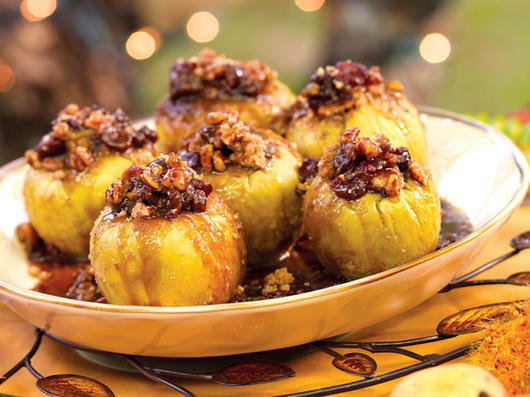 These baked apples are so easy and are a guilt-free breakfast, lunch, snack, or dessert! Feel free to put your own spin on the filling. Enjoy! Use an apple corer (I use a small spoon and paring knife) to take out core and seeds. Leave bottom 1/2 inch of apple in place. Mix all ingredients together in small bowl EXCEPT water and butter. Place apples in glass pan and fill with mixture. Top each apple with a small slice of butter. Pour boiling water into bottom of pan, cover loosely with foil, place on middle rack of oven. Bake for 20 mins, remove foil and bake for 15-20 additional minutes. Skin of apple should be wrinkled, but apple should NOT be MUSHY. Cook only until apple is soft enough to be punctured with a fork :).